A couple of weeks ago, Ade came back from the allotment with a bunch of baby carrots. 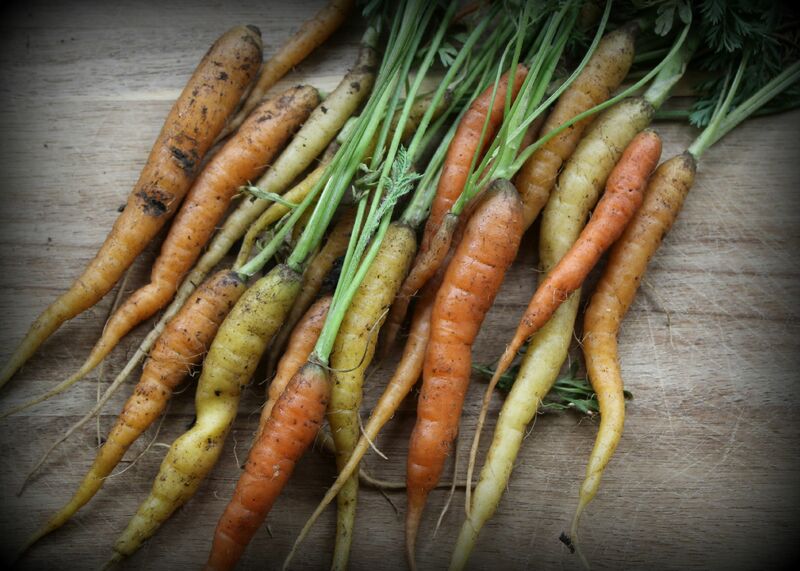 He’d thinned the carrot crop to allow the healthier plants room to grow, and bought the rejects back to me in the kitchen thinking we could still use them. I’m glad he did. Ever the champion of the underdog, I thought I’d find a way to showcase these little beauties and ensure that, even if they were never going to reach full maturity, they would still fulfil their culinary destiny! 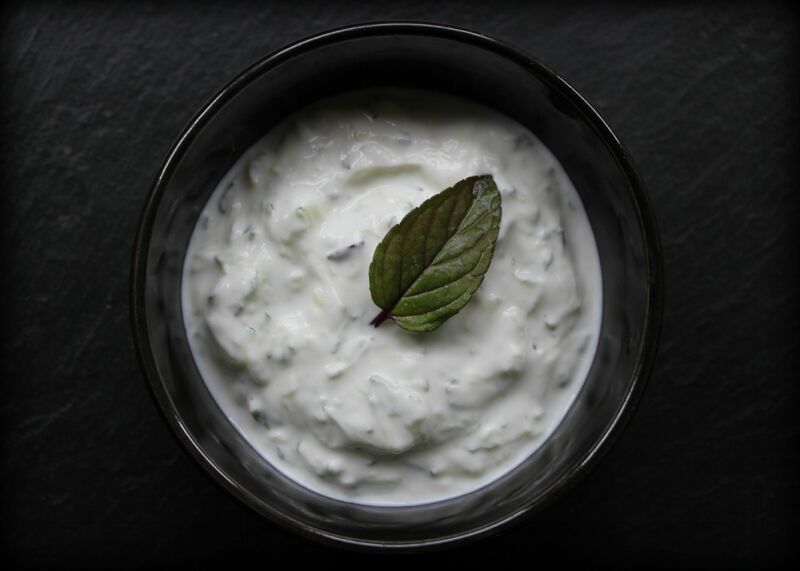 So they became crudités, and made a deliciously crunchy companion to this heavenly homemade dip which uses our home-grown cucumbers, mint and garlic. As my grandma used to say, waste not, want not! Place the yoghurt in a bowl. Chop the cucumber in half and slice each half lengthways. Scoop out the seeds. Grate the cucumber and place it in a clean tea towel. Squeeze out as much of the moisture as you can. Add the grated cucumber to the yoghurt along with the rest of the ingredients. Stir well. 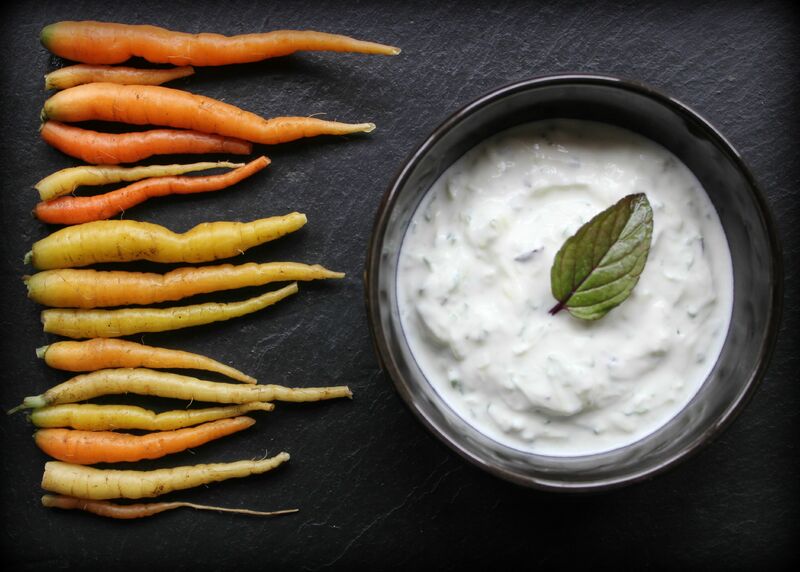 Garnish with a mint leaf and serve with baby carrots as a fabulous home-grown hors d’oeuvre! Wise grandmother! In Maine, we have also inherited that philosophy. I will soon be trying the dip recipe soon, and those little carrots are lovely. And delicious, too, I bet. They were pretty good! 🙂 Hope you enjoy the dip! Yes, thankfully our cucumbers are doing really well, we’ve had quite a few already – and as you say, they make up for the loss of onions!